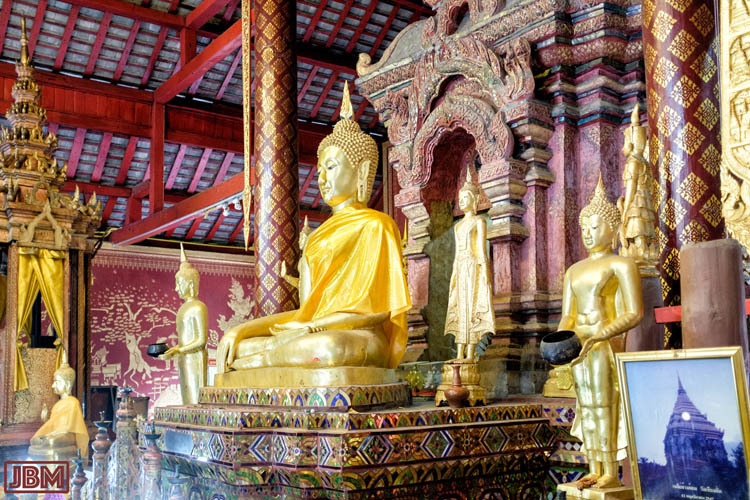 The Buddhist temples (wat) of Thailand are beautiful and fascinating places. 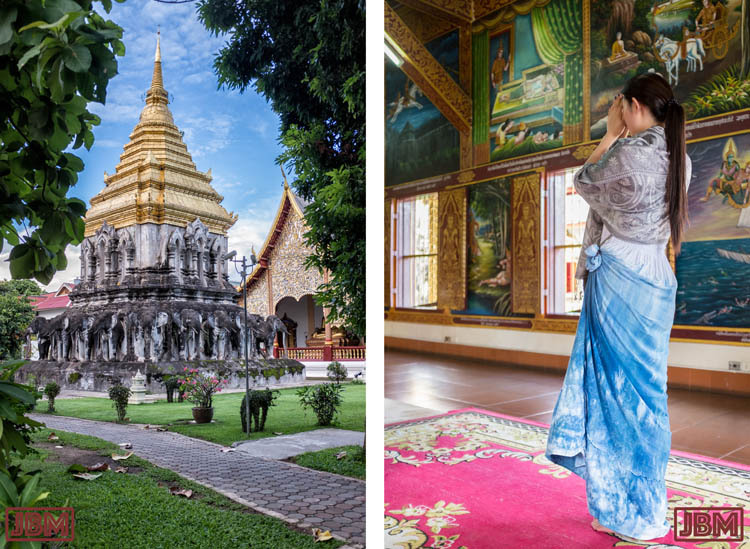 We recently had a too-brief (5-day) visit to Chiang Mai in the Central North of the country, and visited some of the many many wat that dot the landscape. Just inside the relatively small area of the old walled city there are 3 dozen active temples. Across the entire city there are, depending on which source you consult, more than 200 or 300. Suffice it to say that there are a whole lotta wat. Each wat has a character, a history and an atmosphere unique to itself, but each one is an oasis of calm and elegant style in the midst of a bustling city of 960,000 people living in the metro area. We first visited Wat Phan Tao, which is just over the road from where we were staying in the Old City. The old (late 14th century) viharn (assembly hall) is constructed entirely out of teak wood. 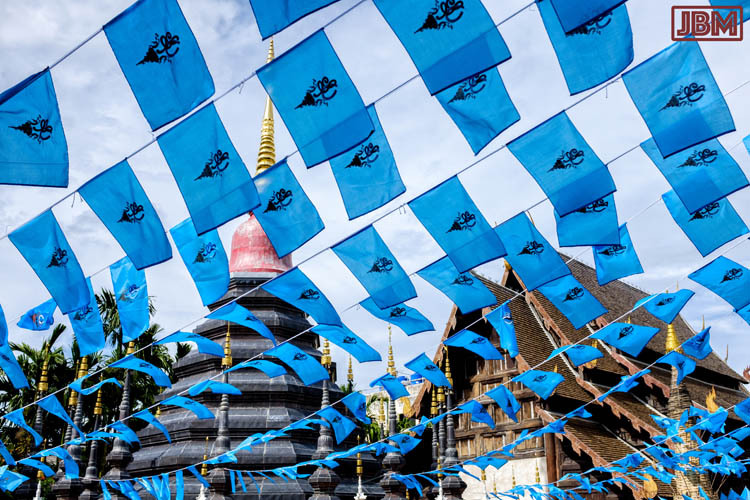 There were hundreds of blue flags flying around the grounds at the time we visited, blue being the colour of the revered Queen Sirikit – whose 84th birthday was about to be celebrated. 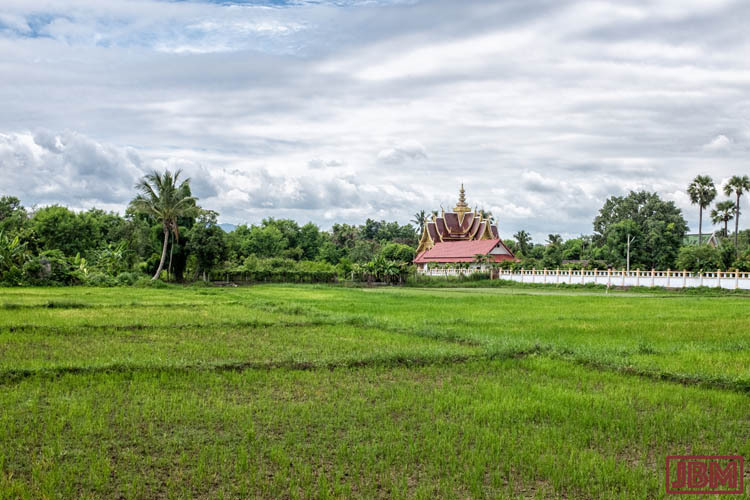 The flags almost obscured the view of the chedi (stupa) which stands behind the viharn. The wat was originally built as a palace for one of the early rulers of the Lan Na Kingdom. A carved panel over the entrance still displays an ornate peacock, the symbol of the monarchy, standing astride a dog – which is the zodiac symbol for his date of birth. 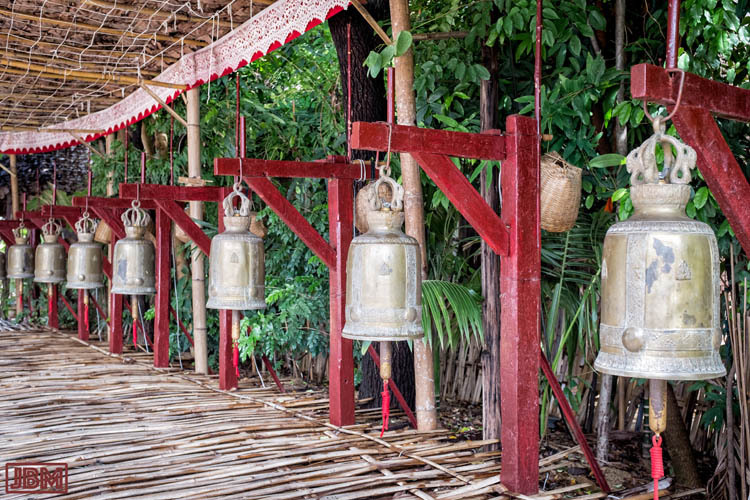 Large heavy bells stand in a row in the garden outside. 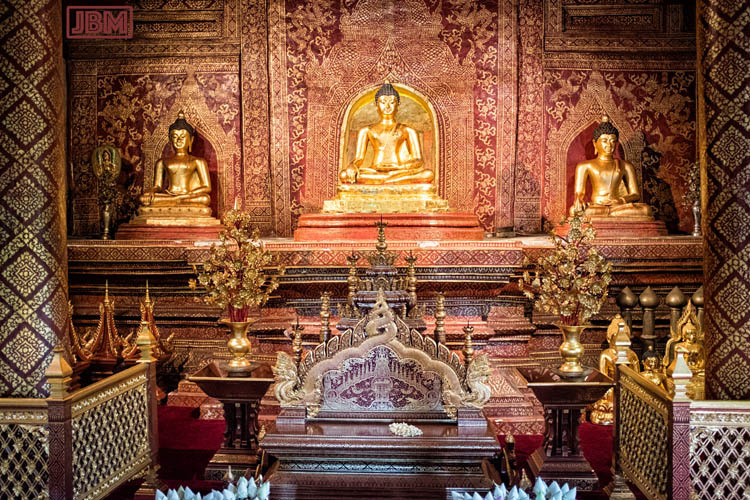 Inside the viharn, a large Buddha sits in blissful meditation with smaller statues in front. On either side of the Buddha figure are suspended two large naga (snake/dragons). They protect the Buddha. There is a story of Buddha, meditating under the bodhi tree after attaining enlightenment, when a severe story erupted. A huge cobra snake came and shielded him from the rain with his big hood. 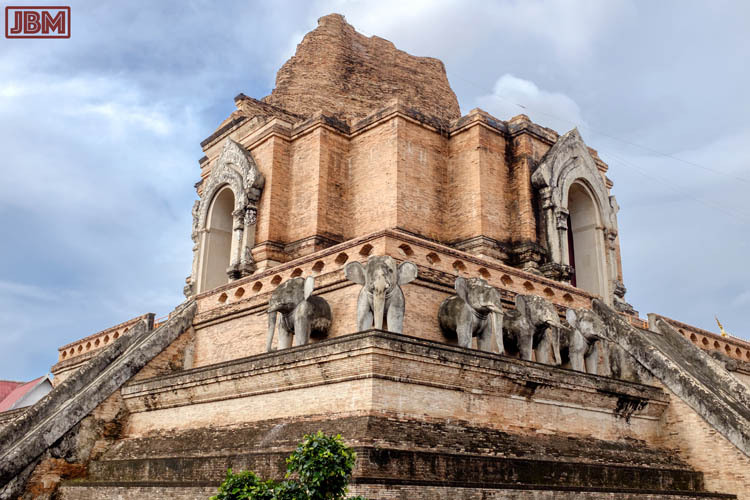 Next door, in front of the very much larger Wat Chedi Luang, is a small but richly decorated shrine for the Sao Inthakin (City Pillar) of Chiang Mai. 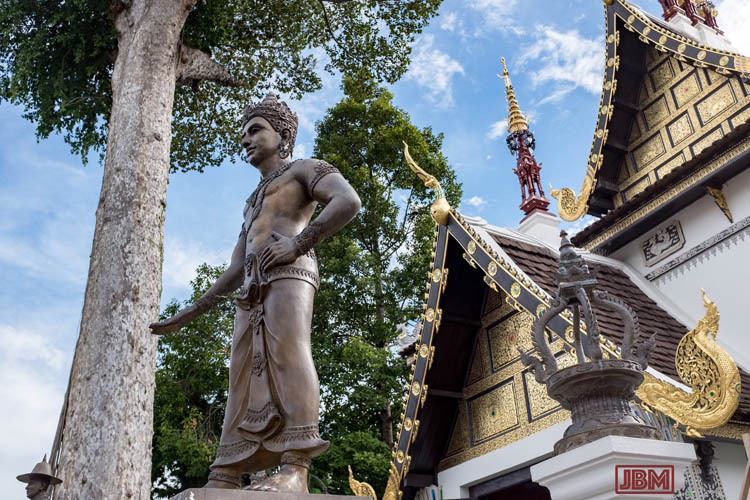 Such shrines are found in cities across Thailand, and it is considered that the prosperity and safety of the city is dependant on the city spirit deity (Chao Pho Lak Mueang) who resides there. Women are not permitted inside. Wat Chedi Luang is so named because of the stupa located there, behind the (much newer) viharn. 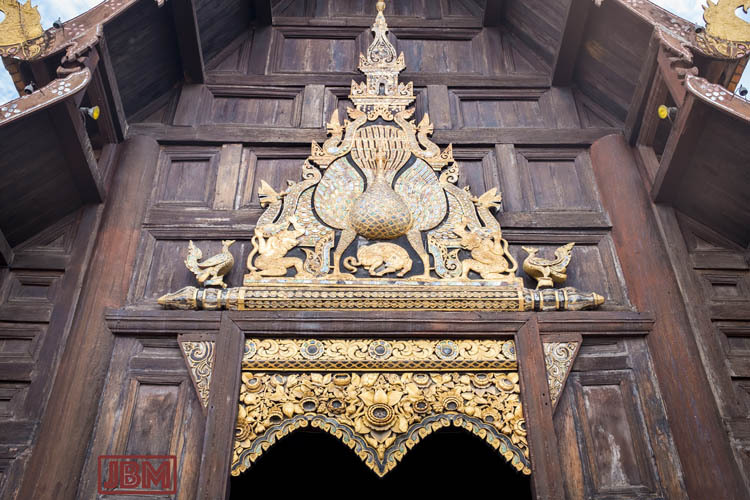 This massive structure was first erected in 1391, to house remains of the father of the king (Saen Muang Ma). Construction continued for nearly a century, by which time it was some 85 metres tall! For a time it housed the Emerald Buddha, the most sacred Buddha statue in Thailand, before it was moved (first to Luang Prabang in Laos, and then to its current home at the Wat Phra Kaew in Bangkok). In 1545, an earthquake caused extensive damage to the chedi, and at least the top third was lost. There were partial restoration works conducted in the 1990s. It’s still very impressive! 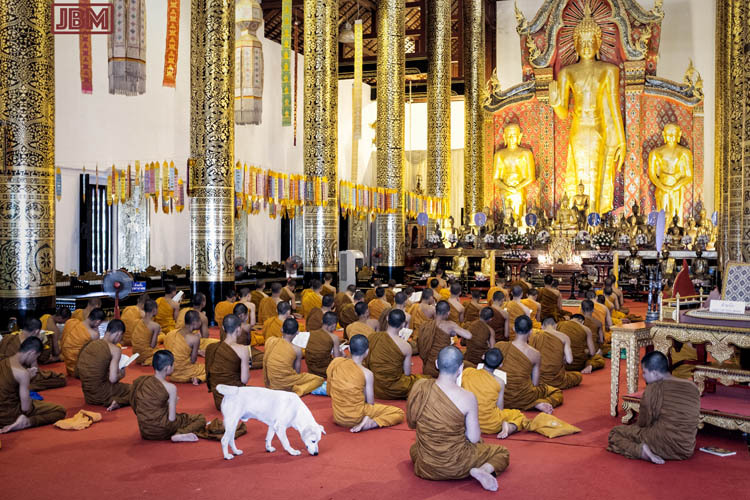 The main assembly hall (viharn) was built in 1928, and is itself rather impressive – especially so when the monks (Wat Chedi Luang is an active monastery) assemble for evening prayers. One stray temple dog wandered in and out during the prayers, which appears to be a regular occurrence, as no-one seemed overly concerned. 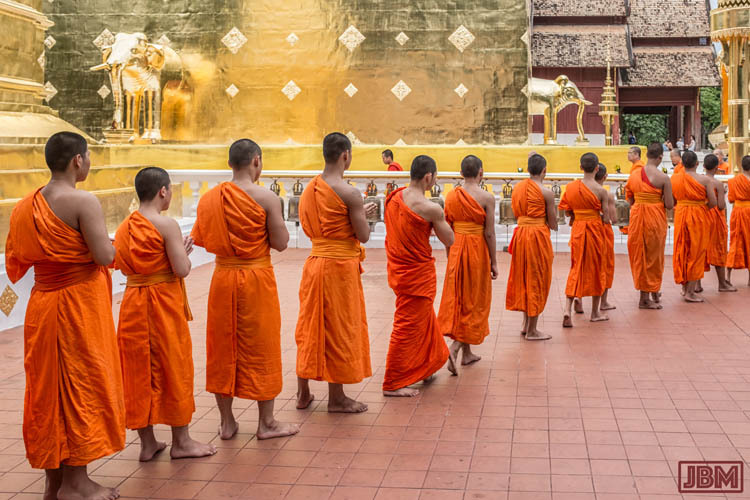 One monk made a half-hearted attempt to expel the intruder – who then simply re-entered through another door! 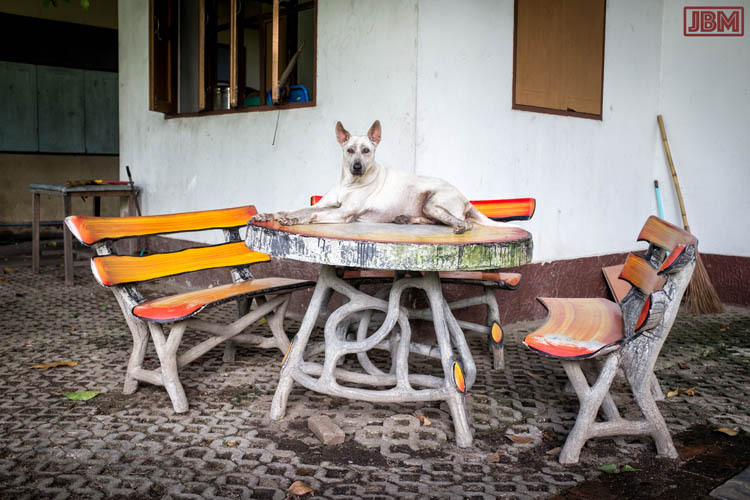 Speaking of temple dogs… at the Wat Chiang Man there were many resident dogs, including this lordly creature who looked like he was holding audience on his throne. Wat Chiang Man is the oldest temple in Chiang Mai, dating back to 1296, when the city was founded. The chedi here is quite different to the one at Wat Chedi Luang, fully intact and quite elegant in form. 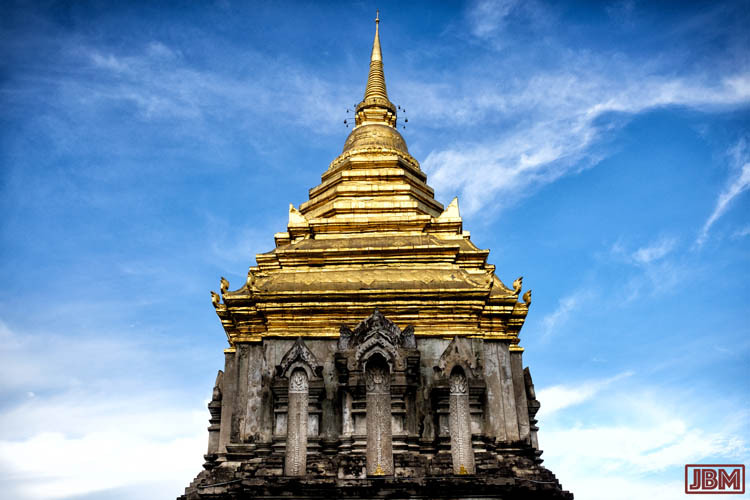 The top, gilded part of the chedi contains relics – of the Buddha, or of some auspicious monk. The main viharn was renovated almost 100 years ago. Behind the large Buddha (and not visible in the photo above) is another Buddha, standing and holding an alms bowl, which is the oldest Buddha in Chiang Mai, dating back to 1465. There are a limited and prescribed number of standard Buddha poses – standing, sitting, walking, reclining – and also a number of specific gestural variations. I particularly like the ‘calming the ocean’ pose. The depiction must be executed correctly, if the Buddha is to have power. 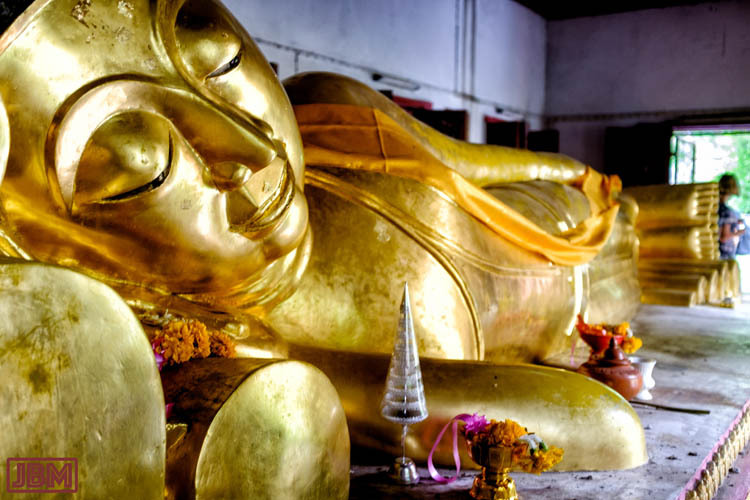 The Reclining Buddha shows the Buddha lying on his right side, close to death and about to enter into the state of paranirvana. We encountered this Buddha at a Wat (not sure of the name! ), east of Chiang Mai, while on a bicycling tour. 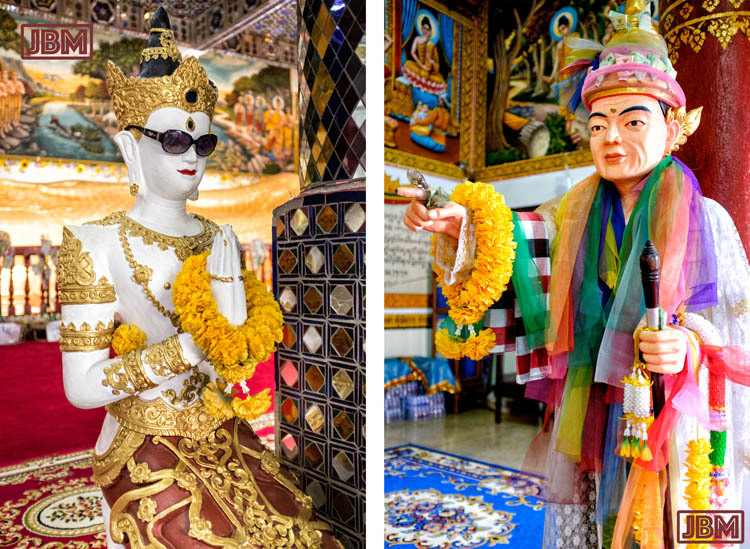 Some of the statues in this new wat were very colourful and, with the sunglasses as above, perhaps not quite as seriously reverential as we saw elsewhere. 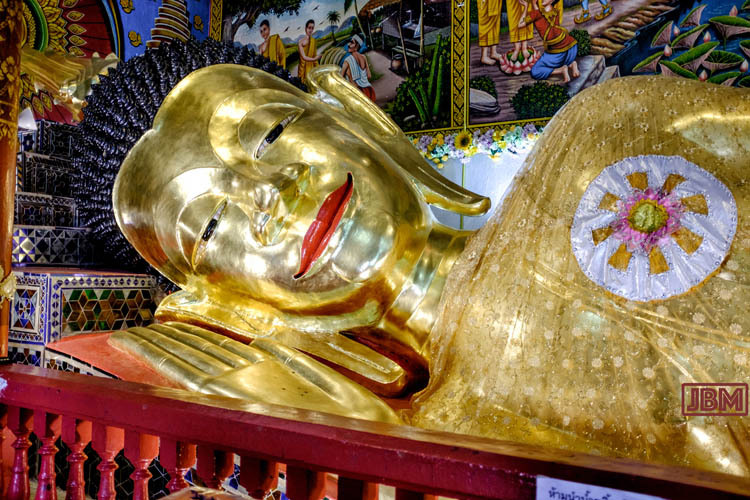 Another reclining Buddha, this time in repose at the Wat Phra Singh. You may be able to see Karen standing by his feet. This large and stunning wat dates back to 1345. 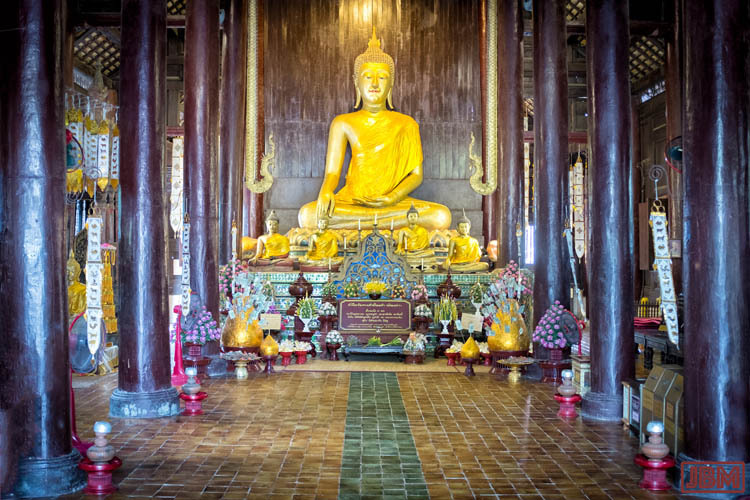 It got its current name in 1367, when the famous statue of Phra Singh Buddha was brought to the temple, and housed in the all-teak Viharn Lai Kham. The Phra Singh Buddha is reputedly from Sri Lanka – though there is also evidence that it was actually made in Chiang Mai. Another story tells that the head of this Buddha was stolen in 1922, and that the statue now sports a substitute head. This statue is greatly revered, and is carried through the streets during songkram festival is April. 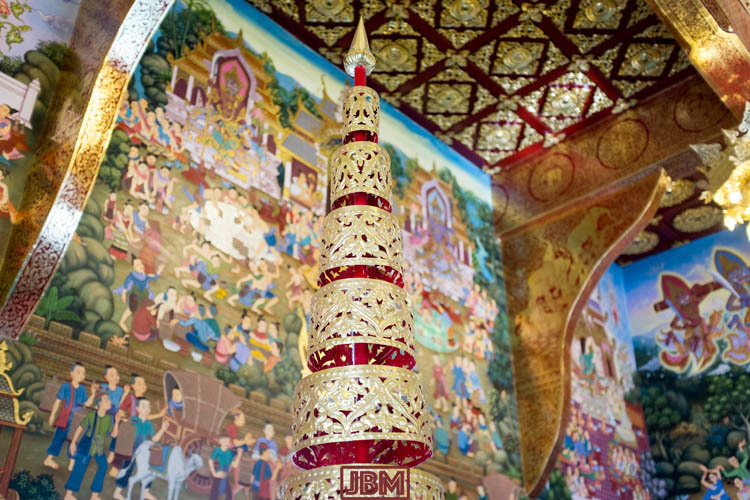 The wall behind the Phra Singh Buddha is red lacquer, decorated with patterns of gold leaf. The other three walls inside the Viharn Lai Kham were decorated with mural during the 1820s. 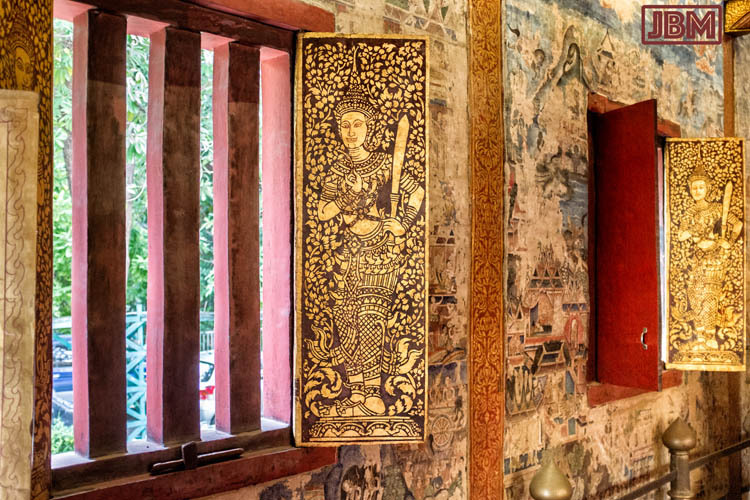 These detailed murals depict stories from Buddhist mythology as well as from Chiang Mai day-to-day life, and are amazingly detailed – though fading in places after nearly 200 years. The complex of buildings has been extensively restored on several occasions, including in 1782, 1920 and 2002. 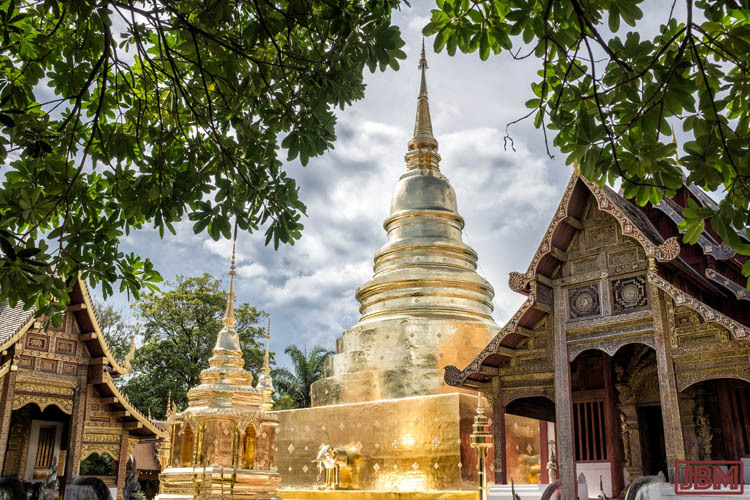 The very shiny golden chedi (known as the Phrathatluang), with a golden elephant emerging from each of its four sides, is dazzling, and almost too bright to look at when the sun is shining. 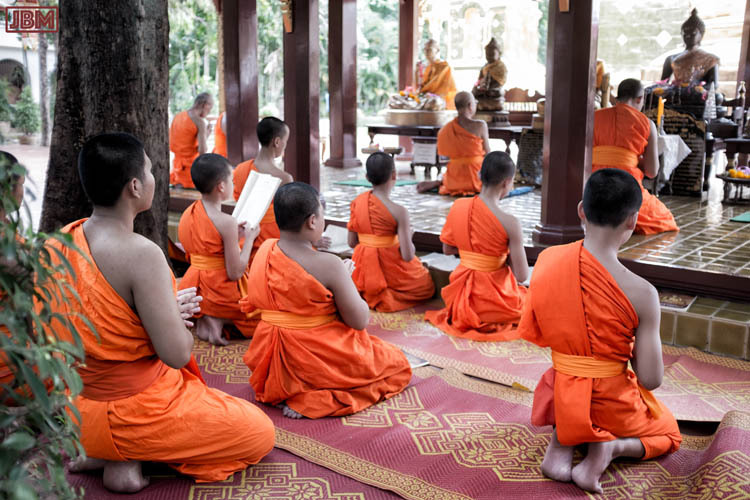 The wat houses a large number of monks (all male), ranging from the very young to elderly and wheelchair-bound. All gather several times a day for prayers at different locations around the complex – including afternoon prayers here under a breezy sala (pavillion). 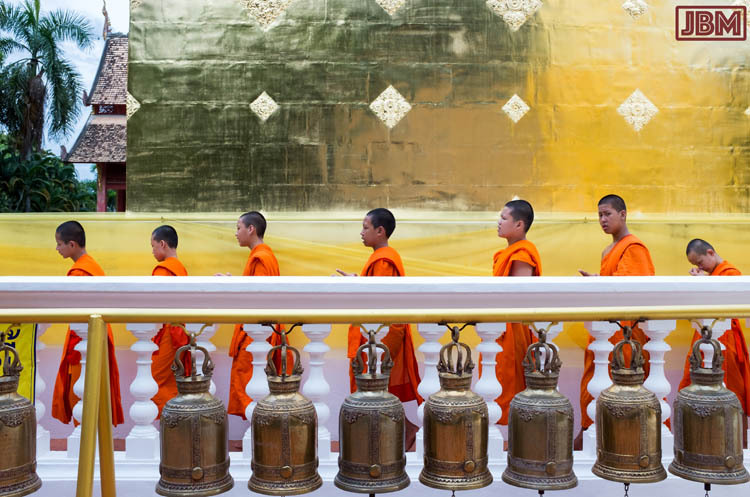 The monks make three clockwise circumambulations around the chedi, chanting quietly in unison as they walk. 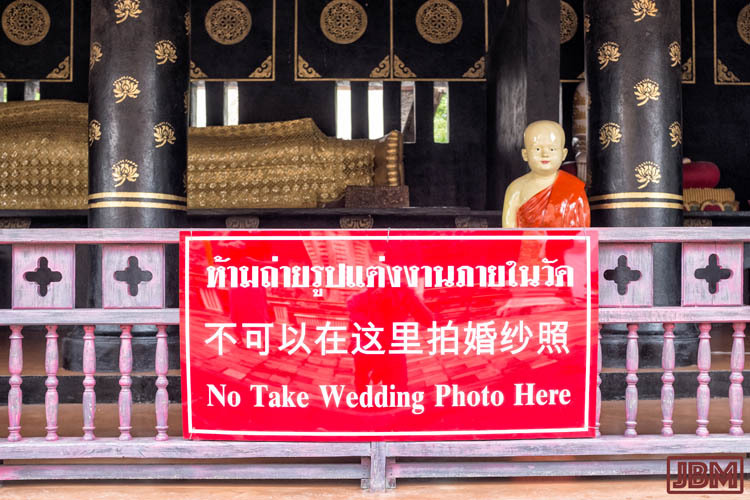 We saw this quite firm instruction near a reclining Buddha figure at the Wat Chiang Man. We were of course disappointed, but we dutifully refrained from take wedding photo there.